For the past many years I have organized my coupons in small vertical photo albums that hold three photos on each side (see my post “Organizing coupons” for details). This worked great because I could just slide my coupons in the slots and I could see six sections at once. I didn’t need to fold many (except the Target coupons which are a bit bigger) and I could see the whole coupon. I could open them in the basket of the shopping cart and they were lightweight. I was using more coupons and could easily compare deals while in the store, versus how hard it was to find what I needed when I used an expandable small coupon holder. My husband and I often got compliments at stores on what a great idea they were. However, we needed three of these such albums to hold all of our coupons: one for groceries, one for toiletries/supplies/household items, and one for store coupons and amusement. It was a pain switching between albums while at Target and sometimes they wouldn’t stay open in the cart basket. The pockets were also ripping a bit and it was sometimes hard to get a small coupon out, since you could only reach inside the pockets sideways. So I decided to make a leap to try the cloth zipper binder method that so many couponers use. I decided against the decorative coupon holder/bags, because I am sure my husband would not want to carry something that looks like a lady’s purse! 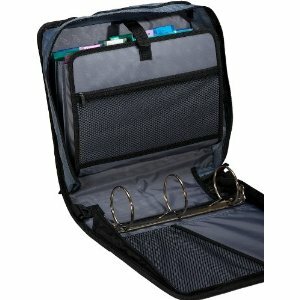 I bought a 3″ 3-ring Case-it zipper binder from OfficeMax, not as cheap as they later went on sale for at Target; but my husband couldn’t find any at our local Target. I then researched page protectors/coupon holders and decided that I liked the three slot holders best because it would be similar to what I was used to. I found a great deal from Hobbies Depot for a pack of 100 for less than $20 (and no shipping charge). They arrived the other day and much to my dismay and surprise, they were one-sided! I had no idea they were like that. My friend and fellow couponer, Jessi, assured me that I had not bought the wrong thing; they all were one-sided. Thus, my dilemma – how to maximize my storage capabilities and still have a system similar to what I was used to (6 sections to see at once). In comes my patient, helpful, and intelligent husband, who obliged by listening to my problem. Then he came up with a brilliant solution! Adhere the page protectors back-to-back so that we had slots on both sides! I found some double-sided removable Scotch tape in my office supply stash, and applied 5 small strips to the back of one protector and attached it to the back of another protector, so that each had the pockets facing out and the tops the right way. The only downside is that our “coupon” albums had a white backing behind the pockets so that you didn’t see through to the other side. We thought about maybe putting a piece of paper between the two page protectors, but this would have made a lot of extra work (with needing to tape twice for each set of pages) and more weight for the whole binder. We will just have to get used to it! I did steal a few ideas from Laurie at Passionate Penny Pincher, thanks to her video tutorial on her coupon organizing. I used a few plastic sleeves that have diagonal or horizontal slits in them. 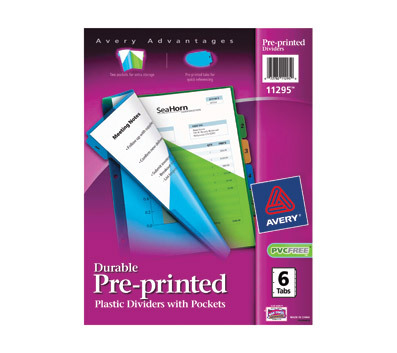 You can get them with or without divider tabs. These I used to hold coupons that I don’t need to necessarily see laid out at a store like automotive, amusement, home repair, medical, etc. 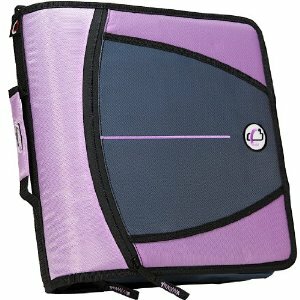 I am so excited to use my new binder! I love that it has a pocket for the coupons I have pulled for the checkout and dividers to hold sale fliers, etc. I even plan to put a copy of my price list in the front. I normally keep it in my purse, so that even if I am shopping without coupons, I have it handy. With the price list in the binder, my husband can use it, too, and it will be easier to flip pages. * For more information on couponing, see my posts “Coupon websites – updated!” and “Don’t throw out your expired coupons!” My friend and fellow blogger, Mara, at Kosher on a Budget, has lots of great information on couponing in her series Couponing Basics. Let me know what your coupon organizing style is and how you have made yours work! Creative Memories photo tape and photo splits also do a great job of adhering items other than photos….. I would have used those, but didn’t have any photo tape in my stash! I also went through almost two rolls of tape! Show it to you tonight! I used to have a nice file box but I’ve let it go as I wasn’t good at keeping up with it. That was how I started out – a coupon accordion. I couldn’t see the coupons so easily and then didn’t end up saving much. My newer attempts have worked so much better and I use them! My husband even does! Thanks for reading!